I was just reading the LotFP module The Grinding Gear. It has lots of secret doors, and none of them have any mechanisms described. This stuck out after just recently reading this post, OSR Contradiction 2: Player Skill vs. Minimal Dungeons, over at Roles, Rules & Rolls. Further, the Grinding Gear secrets are not “optional” extras; they are required to proceed with the adventure. Both Hammers of the God and Death Frost Doom also have major areas (as in, one third or more of the module content) that can only be accessed if a secret door is found (though some of these secret doors provide specific opening procedures). My entire style of running (and writing!) adventures just wouldn’t work with a “one chance only” approach, and to repeat again, I had no idea this was a rule in any version of the grand ol’ game, let alone having any idea that people actually played that way. I use the Moldvay/LL ‘one try only’ rule. It makes elven door-finding and dwarvish sliding wall detection more useful. And since the rule is one try per person, it encourages bringing more people on the mission. And swords, wands and artifacts that detect secret doors are more valuable if you can’t easily find them. Also, I like the game to have some roads that are just as real as the one trod by the PCs, but for some reason or another they can never go down them. You don’t roll a die to determine if you find and open a secret door, you gather information by asking questions and using your personal smarts to make choices to test the situation to discover the door. Then you make choices about how to open the door. * There is one specific way to open the door. There isn’t a ‘proper’ solution to the encounter because there is no reason you are entitled to find the secret door and no reason it is necessary to find the secret door. *But what about searching for secret doors, talking with monsters, and bashing doors? Situations that are common but just use some random game system to determine the result? How is that player skill? Unlike modern systems where there is no consequences for failure, each of those is a choice that must be made. Do we risk one turn searching and increase the chance of running into a monster? Do we give up surprise to attempt to parley with the monsters? Do we risk the chance of monsters hearing us bash this door? Each is a choice, weighed with consequences for the attempt and for failure. That is why those are examples of skill based play. My general mode of operation recently has been none of these. My rule has been that if a secret door is indicated and no description is provided, then searching the area is sufficient to locate the door without making any roll. Just saying “I search the room” is not enough (but it does give you a d6 throw chance), but saying “I spend three turns searching the 30 foot north wall” is. This is clearly not one of those oh my god you’re so stupid you’re doing it wrong kind of things. If Mr. Rients, Mr. Raggi, and Mr. Hack & Slash all have different (and incompatible!) 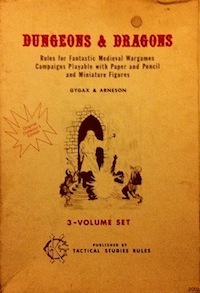 approaches, I think the only conclusion to be drawn is that even within the relatively restricted field of traditional D&D (let’s say this set includes TSR D&D prior to Second Edition and the associated retro-clones and simulacra) there are several common methods of play. Learn how they work, pick your favorite, and modify any modules you run to fit your method of choice. * Mostly unrelated, it seems like the original name of Hammers of the God was Old Miner’s Shame, which is pretty cool. This entry was posted in Uncategorized on April 21, 2012 by Necropraxis. My own interpretation of the *mechanism* of a secret door is that, unless there is a different description in the level notes, the door is a slab or panel that pivots on a central axle. Thus, if players state they are pushing or leaning against a particular section of wall (and if there is no latch or doorstop,) the door gives and is obvious (no roll.) The secret door roll is the chance to spot clues to a secret door’s location even if the characters don’t do something that would trigger or discover the door. I like this pivot mechanism more than the latch + hidden hinges + trigger (odd brick, whatever) that I usually assume. It also seems more within the reach of lower-technology architecture. I will definitely try this in a future game. Actually, those secrets *are* optional extras. The constructor of the adventuring site specifically intends for groups to *not* necessarily be able to find all the subsections. And a group can still do measurably well (in terms of xp), even if they never find any of the secret areas. Hmm, I’m not sure I agree here. There is some treasure to be had aboveground, but not that much. To advance past the beginning six areas of the first level, secret doors must be found (not to mention the secret door that must be found to get down to the dungeon at all, though that one is a bit easier to find). So, if you don’t find those initial secret doors, you are missing the rest of the dungeon, which around 35 more keyed areas. It is possible that I’m missing some clues here, but I don’t think so. I think it would be very hard to argue that the majority of this adventure is not protected by secret doors. Further, most of the interesting parts of the scenario are beyond these secret doors. For a sandbox where they need not interact with the scenario at all, this is okay (or at least not fatal) but for use as a one shot adventure, it is problematic. … though it looks like Raggi has a different opinion of what the constructor of the adventuring site intended. (See the LotFP forum thread referenced earlier.) Given that he’s the author of the module, it’s hard to argue against him. But despite his intent (and his use of retries), secret doors don’t end up just being a time-sink. There are some areas that PCs don’t think to check for secret doors (or never have a reason to check for), and therefore never find. Which is what happened when I ran the module for my group. And Raggi also echoes this sentiment in the playtest notes in the module. So for all practical purposes, I still stand by what I said in the previous comment. I love secret and hidden doors in your typical computer/video game. It’s a great reward for all the exploring you’re putting in. On the other hand I hated it in pretty much every version of D&D. If I’m drawing up a dungeon about the only time I put a secret door in is if it’s a shortcut for important cultists and minions to move about. I’ve actually been dreading my players getting to the actual Temple of Elemental Evil because a number of the incredibly useful secret doors are not obvious. I’ve taken to using the d6 detection as merely that, detection only, the way to open the door has to be determined by the player’s interaction. Of course as Roger’s Contradiction post illuminates, secret doors are a plenty but actual descriptions of their mechanisms are rarely to be found. Secondly, I believe my position requires clarification. All my secret doors have a specific activating mechanism. This is, to date, something that has always been immediately visible. “detecting” the secret door, doesn’t give the players information about how to open it. It is possible to both miss, AND be unable to figure out how to open secret doors! However, if they explicitly say they are searching an area in such a way that would reveal a secret door? Then that door is automatically discovered as you describe.